Having outgrown its britches, or binding capacity, as the case may be, author Vernon Joynson’s title “Dreams, Fantasies and Nightmares from Far Away Lands Revisited” has been put to bed and replaced by two new titles, the second of these “A Potpourri Of Melodies And Mayhem: Latin American And Canadian Rock, Pop, Beat, R&B, Folk, Garage, Psych And Prog 1963-1976” is reviewed here. It is also important to note that while the book mainly covers the period 1963-1976, releases by bands that carried on beyond this time frame are included, albeit perhaps not in quite such detail. 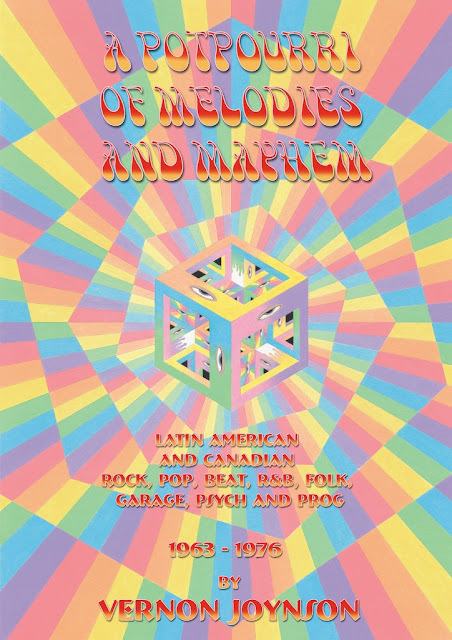 2008 marked the definitive edition of “Dreams, Fantasies and Nightmares From Far Away Lands Revisited: Canadian, Australian, Latin American and South American Rock and Pop 1963-1976. Sad to know it will never again be updated. 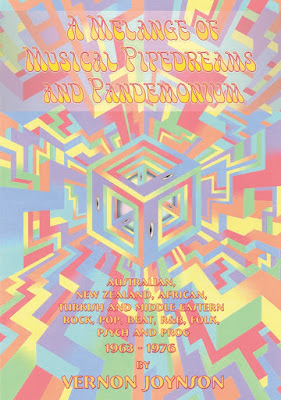 Fortunately, the news was actually incredibly good as the demise of “Dreams” gave birth to two new titles, the first, “A Melange Of Musical Pipedreams And Pandemonium” allowed the inclusion of entries for bands from Turkey and The Middle East to be surveyed for the first time, joining bands from Australia, New Zealand and Africa! “Melange” was reviewed earlier this year, so now the time has arrived for reviewing the second volume, and a most impressive addition “Potpourri” is indeed. “A Potpourri” follows the format of author Vernon Joynson’s expanded two volume edition of “Tapestry Of Delights” so far as the information contained in each band’s individual entry. This means detailed discographies, line-up data, bibliographies, comments regarding their music, compilation appearances, and an up-to-date rarity scale for all albums releases between 1963 and 1976 are included for each band entry. This means LP and single releases, both original and reissued, are included, and beyond that excellent descriptions for each and every band as well. Also, the 12 page full color section of album artwork photos is joined by copious numbers of black and white photos in individual band entries. For the devoted music collectors, as well as casual music fans, this is invaluable information. The handsome, softbound book, 896 pages in length, is available and retails for 55 pounds sterling. It is surely worth full retail price, but is available presently from many fine book sellers at a greatly discounted price, at a time when such discounts are greatly appreciated by purchasers, and are especially important at a time when hard copy books become increasingly rare and pricey. From a personal standpoint, the inclusion of the Canadian band, Bent Wind, fronted by my friend Marty Roth, is greatly appreciated. Page 358 is chock full of info regarding Marty and his incredible band, including a photo of the group’s LP “Sussex” and a wonderful description of Bent Wind’s sound as well as an extensive list of reissues of “Sussex” and the rest of the Bent Wind catalog. Proudly joining Joynson’s other incredible rock music encyclopedia, “Fuzz, Acid And Flowers,” “Tapestry Of Delights” and the previously mentioned “A Melange Of Musical Pipedreams And Pandemonium,” this massive volume is absolutely jam packed with information, all available within finger tip range. A most impressive addition indeed, I cannot recommend this work highly enough. Many, many hours were spent collecting data, translating languages, collecting and publishing photographs of bands and album artwork alike. Be sure to pick up a copy before this tome goes out of print and prices skyrocket. I guarantee you will not be disappointed. This was a good review and I had a great time while reading it. I think you should do reviews more often since you are amazing at them as you go in such details and explain everything.. Thank you for your kind words. I have actually reviewed many albums, done numerous interviews, and reviewed and done question and answer pieces with Vernon on the 2 volume "Tapestry Of Delights" and "A Melange Of Musical Pipedreams and Pandemonium" If you type my name into the search engine my reviews and interviews can be viewed although I think there is one by my son Roman that appears before mine begin. But, again, thank you for the kind words and I am so very happy that you enjoyed my review. Feel free to contact me on Facebook as I would love to talk music with you.